I’m very good at buying games. I’m getting better at restoring games. But I’m absolutely dreadful at selling or trading games. My gameroom is something akin to a black hole or Jame Gumb’s basement: the things that enter seldom leave. This was all well and good when disposable income and space were both plentiful. Recently, however, the household (ie. my wife) has tightened the purse strings on frivolous expenses and the basement is reaching absolute critical mass. I’m at the point where furniture would need to be removed to add more games. The once-promised sitting room, housing just “a few” games, where guests could be comfortably entertained, is bordering on a full-fledged arcade with little room for socialization. The eleven games in my current collection eclipses the maximum of eight that my wife once asked me to observe. I am at the point now where one game must to go if another is to come in. And that poses a problem for me. 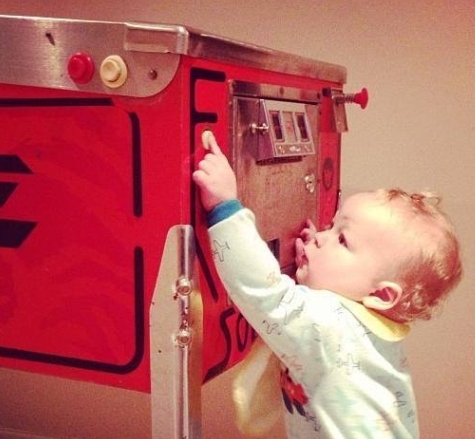 My son, at ten months, “playing” Solar Fire in 2012. I’m not sure how many are affected the same way: I have completely fabricated a personal attachment to each of the games in my gameroom and I have a very hard time letting go. Of the games that I purchased with my own hard-earned money, I’ve only ever been able to bring myself to sell or trade one of them. And trading that one game was tough. Heart-breaking, even. Much more so because it was my very first game that I purchased back in 1995, a Williams Solar Fire which I have written about here. I traded it to a good friend who appreciates early Solid State games from the dawn of the 80s more than I ever will. In return, I got a Pin*Bot which came with an uninstalled Classic Playfield Reproductions playfield. I seized the opportunity to flesh out my collection with a game I enjoy one hundred times more than Solar Fire, but still, packing up that Solar Fire for delivery made me sick to my stomach. I had grown with it. It was the game that started the adventure of building a pinball collection. I understand that these things are inanimate objects–heaps of steel, plastic and wood–and any feeling or attachment I have for them is a construct of my own subconscious, but it doesn’t help ease the distress. I’ve got a whole laundry list of “important landmarks” I can attach to each of my games: the first game I got when my son was born, the first game I completely restored from the ground up, a copy of the game I played endlessly with my father at an arcade when I was growing up. I’ve manufactured reasons to horde these commercial oddities in an unhealthy fashion. I suppose others are affected to a greater extent: whereas I’m reluctant to let go of any one of my eleven fully working games, others have trouble letting go storage units full of games that aren’t even on legs! We’re listening to the same radio station, just consumed at different volumes, I guess. There is also the fact that I covet the value of the bird-in-hand, as opposed to the two that may be in the bush. If I let go of my Addams Family, when will I ever be in a position to get another if the market continues to trend upward as it has over the past few years? To replace a game with another copy in the same (or better) condition at the price point I have originally acquired it would prove to be difficult. I’m more of a “stand pat” kind of guy rather than throwing caution to the wind, and that complicates things. Collectors say it all the time: “You can’t keep’em all!”. And it’s true. Gameroom turnover keeps things fresh, and rejuvenates one’s interest in the hobby. But, I’ve come to love the little intricacies of my games, tinkering with them, making them “my own”, bringing them back to life. I probably enjoy twiddling about in the backbox or under the playfield just as much as I do playing the games. Don’t get me wrong, I probably average about twenty minutes a day in the gameroom actively flipping, however, working on games and playing them with any high level of expertise are two unique skill sets. For many like me, there is little overlap. I’m firmly in the “collector camp”, as my playing skills leave much to be desired. This is probably another reason for my unwillingness to let go: I’ve become heavily involved in making them perform at their absolute zenith rather than just playing the snot out of them with reckless abandon. I’m like a mad scientist who forbids the angry mob from harming the monster he created. I promise, I’m not a freak. I’m not sleeping under the machines or gently stroking them while whispering sweet nothings of how they’ll be waxed later in the week. My wife isn’t being supplanted with Pin*Bot. I just need to learn to let go. I need to suppress these manufactured emotional connections I have. They can’t all be keepers. All still water will get stagnant eventually. White Water, reluctantly packed up and ready to leave. So, two weeks ago, I overcame the manufactured odds and traded my second game. I had to let another escape, if only for my own sanity. I traded my White Water for a World Cup Soccer ‘94 and some cash. The White Water wasn’t collector quality–the cabinet was beat, however everything under the glass was really nice and it was solid as a rock for the three years I had owned it. I liked the game. One of Nordman’s best, for sure. Diverse gameplay, unique layout, fantastic art and perhaps the best music ever created for a pinball machine. But it wasn’t getting much play by anyone other than me. When guests would visit, White Water wasn’t given a second look. Even my three-year-old son, who indiscriminately, yet passionately, flips away on all the machines, gave the game the cold shoulder. On the other hand, I really wanted a World Cup Soccer. My collection was devoid of a John Popadiuk-designed game, and World Cup is the only one of his that can be had without breaking the bank. More importantly, my three-year-old son has played soccer since he could walk and has really taken to the sport–I thought he’d get a real kick out of the game (pun intended). A really, really nice one became available, and my potential trade partner wanted my White Water in return. I came close to pulling the plug at a few points during negotiations, but I finally cut the cord, folded up White Water with little fanfare and brought home a World Cup Soccer ‘94. 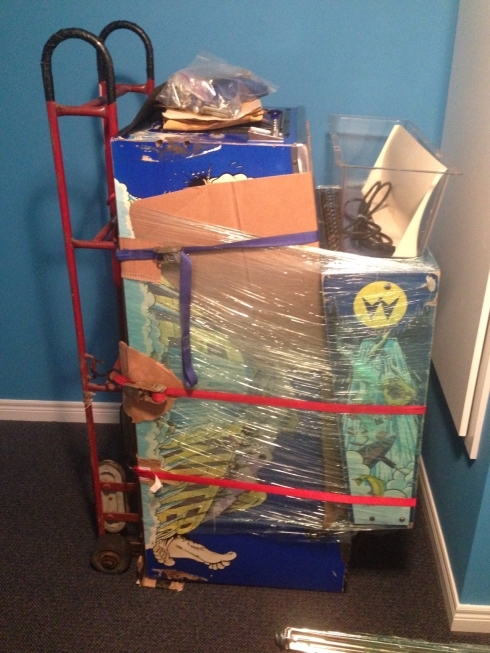 (Not having moved a game OUT of the basement gameroom proved to be a blessing in disguise for all these years–turns out they are much more heavy and awkward to remove than they are to put in). A friend of mine says that with each game exiled, it only gets easier to see them leave. I hope he’s right. Any regrets I had about the trade quickly eroded when I lifted the backbox on World Cup and my son, standing on his overturned milk-crate softly cooed: “Soccer ball pin ball…my favourite!” His eyes were like saucers and he was grinning from ear to ear as he took in everything from the cartoon dog Striker on the backglass to the rotating soccer ball on the playfield. During his first game he raised his hands in victory when he scored his first goal, only to have the ball immediately drain while he was celebrating as it was kicked back to the right flipper. On separate occasions, he excitedly tried to explain to a lady at the library and his long-time soccer coach about our new gameroom acquisition. Neither could understand him, as excitement turned him into a complete marble-mouth. I had to explain on his behalf. I then had to explain further that, yes, we did have a full-sized pinball machine in our basement, and, yes, we did have more than one. The boy playing his new favourite game. Made the trade worthwhile. Only today am I struck by the irony: World Cup Soccer is the game my son now runs to first when we visit the gameroom, and he has even started to refer to it as “his” game. 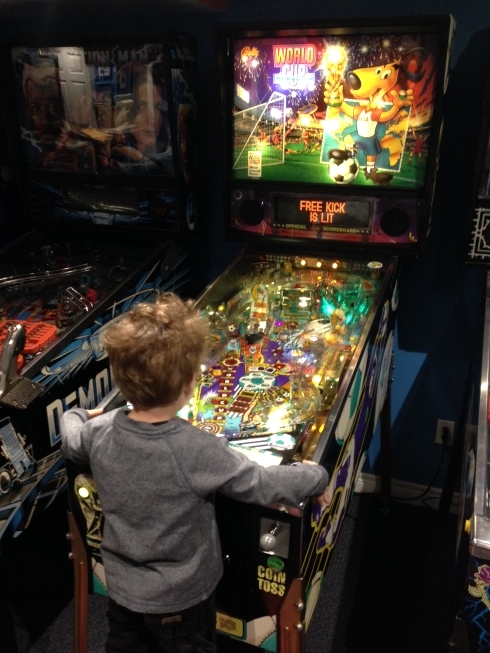 Thus, the kid is a chip off the old block when it comes to forming emotional attachments to pinball machines. Looks like we got another keeper on our hands and a potential problem when it comes time to get rid of World Cup Soccer. However, my emotional attachment here isn’t with the machine…clearly, it’s with my son. And that’s something that can’t be fabricated. Categories: Opinion | Tags: Dennis Nordman, Gameroom, John Popadiuk, Letting Go, Pin*Bot, White Water, Wife, World Cup Soccer '94 | Permalink. Perhaps I’ve just been spending too much time within the friendly confines of minor league ballparks this summer, but I think it’s time for the pinball industry to revisit sports themes: baseball in particular. In the current climate, it is going to need a licence attached to it: the participation of Major League Baseball and its players association. I think Stern is up to the task. Games with sports themes have not fared well in the recent past, however I think now is the time to give the theme another trip to the plate, so to speak, despite the built-in trouble areas that exist in getting sports-themed machines off the ground. There are notable exceptions in that list, and they all seem to be Bally/Williams titles. No Good Gofers is a fantastic comedic take on golf and is the highest ranked game on the above list, and Indy 500 well deserves its top fifty rank as it is a solid game with some unique Nordman-esque features. World Cup Soccer ‘94 is on everyone’s list of fun and affordable DMD games for both fledgling beginners and collectors with extensive lineups. (Plus, it is the cheapest John Popadiuk title available, so that boosts its in-demand status.) Baseball only appears once with Big Hurt, which was licenced through the Frank Thomas and Reebok camp only, and not endorsed whatsoever by Major League Baseball. Past that, it gets really dicey. Exactly half the games on the list fall into the bottom twenty percent of all games rated on Pinside, which is an extremely amazing, albeit pathetic, feat. 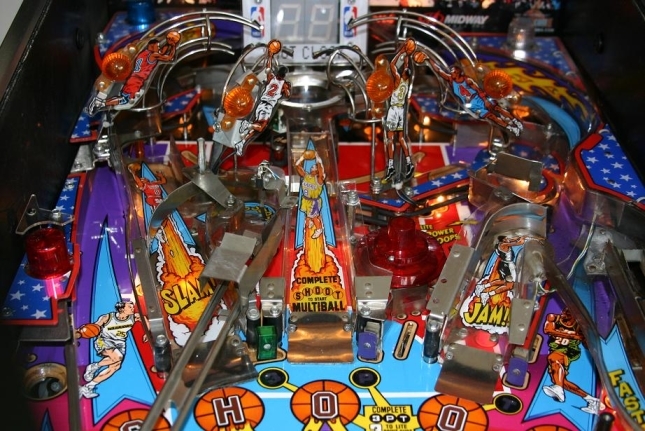 Perhaps pinball players are not all that keen to have sports mixed in with their pingames, or maybe designers are so handcuffed by trying to stay true to the rules of the featured sport that it ends up skewing the overall flow and play of the game. Stern already had a kick at the can with two sports licences, the National Basketball Association and the National Football League. As I was compiling the above list, I was surprised to see that it was only five years ago that Stern released their NBA title. To me, the game seems much more dated than it actually is, probably due to its licence association with the older Williams NBA Fastbreak release. Why Stern released their own version of an NBA-themed game after Fastbreak appears to be unfathomable, but it was the result of downsizing. The game was originally slated for overseas export only, but once downsizing occurred, a decision was made to produce the completely developed NBA game rather than spend money developing something else. This must be the reason why the design and execution of the game feels wholly incomplete. A few years earlier, Stern’s NFL football-themed machine was an uninspired repackage of Striker Xtreme, their soccer-themed game, whose translite featured a different NFL team, depending on the hometown team of where the game was shipped (or the buyer’s personal preference). 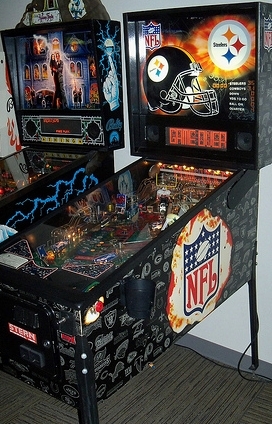 Both the NFL and NBA games were met with indifference by the pinball community and exist as lazy attempts at letting the theme make up for lack of unique design elements. Because of this laziness, both games now reside at the bottom of the Pinside Top 100/200/300. Stern’s Striker Xtreme: “NFL LE”, with a Pittsburgh Steelers translite. With Gary Stern’s frequent assertion that his company is “Made in the USA” and with baseball-mad Chicago being his home base, it is curious as to why Stern has not optioned Major League Baseball to partner with. The appeal of baseball is certainly on-par with that of basketball on an international level, with international sales traditionally being a key factor in theme selection. However, there is a fantastic market for such a game here in North America alone. While football relies on tailgating in parking lots, I would argue that much of baseball’s pre-game drinking takes place at sports bars, with Wrigleyville in Chicago being the penultimate example: a row of drinking establishments all vying for pre-game patronage. What better place to put one of these machines than in a sports bar catering to the pre-game crowd? Especially given the recent resurgence of the bar as a bastion for pinball. I’m sure Major League Baseball could get a few of these machines into the stadiums themselves, as well. 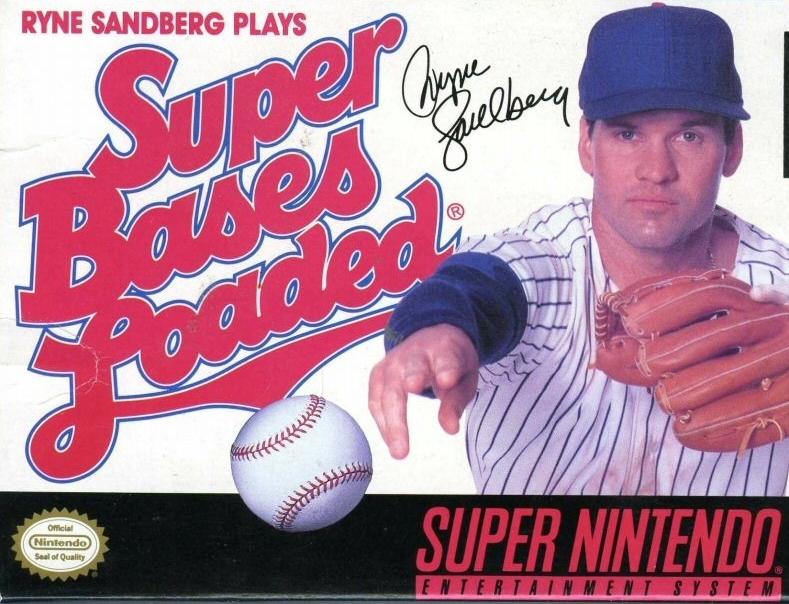 Jaleco didn’t pay the league, now Ryne Sandberg has to play ball in a generic, cheap lookin’ Cubs uniform. A Major League Baseball pinball machine would run into the same problem as the NBA machines before it: it would remain “current” only for a season or two before: a) free agency takes over, moving players to the highest bidder, and b) uniform sales falter, forcing teams to consider a change in colour or logo. Whereas themes like AC/DC and X-Men seem to remain timeless, team logos, colours, home cities and player rosters change so quickly in the business of sports today, that it automatically puts a timestamp on a product such as this. One could argue that the DMD player and team appearances could be tweaked, at least somewhat, in code updates…but we all know Stern’s recent track record with that. To erase the team names or star players from the machine, in effect short circuiting the need for a licence, isn’t an option. A generic baseball theme just wouldn’t cut it. It will always feel cheap and incomplete, like when you see a top athlete in a deodorant commercial playing his sport of choice wearing a generic white uniform and not the uniform of the team he plays for. The deodorant company obviously didn’t have the dough to licence the team logo through the league, and their commercial ends up looking like a top player playing sandlot ball. Themes of this nature are a hard sell right out of the gate. 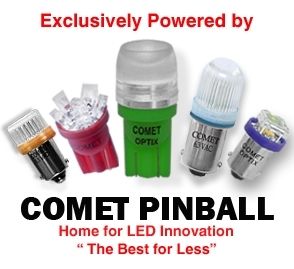 What is the crossover of people who REALLY enjoy baseball and REALLY enjoy pinball? When Stern released Mustang, there was an overwhelming number of people who took the stance: “I’m not a car guy, I’m not buying this machine.” Contrast this with the announcement of AC/DC, Metallica or Star Trek: while pinball collectors/players may not be a fan of that particular genre of music/film, it seemed that they still reserved judgement and played the game before making a final call. You hear far more stories of people stating, “I don’t like ACDC/Metallica music but I bought the game because it plays great”. I think you would have to be prepared for people to dismiss the game right out of the gate with the MLB theme attached. With all the problem areas stacking up, it appears that the MLB theme wouldn’t be all that good of an option for Stern. However, I am intrigued by the fact that John Trudeau is now working for Stern, and has a semi-rich history with the theme of baseball. 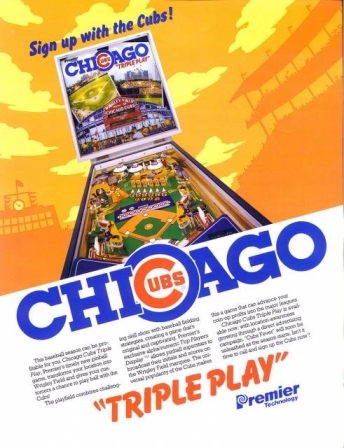 Trudeau designed the Chicago-area favourite Chicago Cubs Triple Play for Premier, a veritable staple in the basements of Cubs fans and in the corners of Wrigleyville bars alike. He also did the stripped-down, “street level” game Silver Slugger, also for Premier. Further, he was commissioned, by Fox Sports, to design a table for the 2005 MLB All-Star game. It looks as if a physical game was never actually built, but instead the design served as a blueprint for a CGI animation backdrop that appeared in both commercials and lead-ins for the annual meeting of baseball’s greatest stars. Even though the table looks to be a mix of old and new pinball elements (heck, it has both numeric 4-player scoring AND a DMD! ), it looks as if the table’s physics are correct in its design. Mr. Trudeau recently stated in an interview that he’d like to take another stab at a baseball pintable, which is a good sign. Besides being one of the true workhorses in the industry with a flair for innovation, Mr. Trudeau’s designs tend to be synonymous with Americana–from the drive-in meta-theme of the Creature from the Black Lagoon to the All-American muscle car theme of Mustang–making him the perfect candidate to take a stab at America’s pastime. With Trudeau at the helm, here’s my two cents, for free, on how to successfully theme the game. Just as Creature from the Black Lagoon is not actually about the Creature from the Black Lagoon as it is about the overall drive-in experience, I would NOT theme the game around the traditional rules of baseball, instead, I would suggest basing the game around going to the stadium to WATCH a baseball game. Just as you have to complete drive-in features in Creech (such as necking in the back seat of your car of visiting the snack bar), you could do the very same with the stadium experience: buying your ticket, finding your seat, visiting the concessions, catching a foul ball, watching the hotdog or pirogi race in the fifth inning, participating in the seventh inning stretch and so forth. 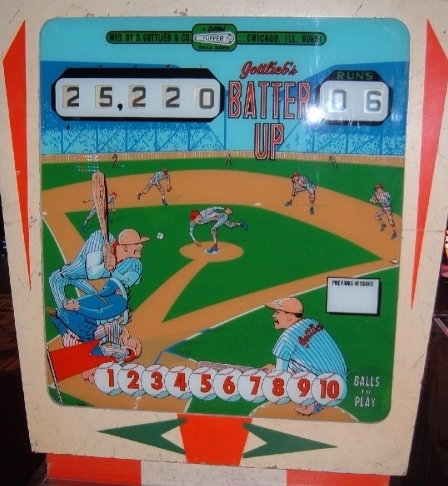 Only in multi-ball, after loading the bases with three locked balls, would you participate in the more traditional rules of a baseball machine by hitting homers and scoring runs. Further, different modes could send you to different stadiums across the major leagues, like Yankee Stadium, Fenway Park or Wrigley Field…kind of like a cross-country baseball tour, exploring the elements that make each stadium unique. With this approach, you could almost get away without the participation of the players association, as specific athletes wouldn’t play as large a role as they would if the rules revolved around the pitching, hitting and fielding aspects of the game. Categories: Opinion | Tags: Big Hurt, Chicago Cubs, Creature from the Black Lagoon, Indianapolis 500, John Trudeau, Major League Baseball, Mustang, NBA, NBA Fastbreak, NFL, No Good Gofers, Stern, World Cup Soccer '94 | Permalink.